smcj wrote: And has Low been authorized to teach? Yes, Chhimed Rigdzin Rinpoche has authorized both him and Gudrun Knausenberger to teach and to give initiations, I've heard him say that about two dozen times and hundreds of others will be able to confirm that. I assume in this sentence the pronoun "him" refers to CR Rin. In that case may there be benefit! Hi Jikan. Just for your reference, the above is just the Chod practice from the Longchen Nyingthig cycle of Jigme lingpa, with some additional prayers connected to the monastery and lineage. It is one of the most popular Chod sadhanas currently practiced in the Nyingma tradition, if not the most popular. It is totally mainstream, just the translation is a little weird. Most western teachers are very traditional when it comes to serious practice, even if it does not look that way by their public talks. I don't know about him particularly, but this is true for many of them, even the most 'innovative' ones, like Lama Surya Das, for example. It is only logical, if one has attained some level of realization through one's tradition, there is no incentive to change the core teachings, but you can reserve them for your closest students. In fact one can usually judge if a teacher is serious by this criteria alone. I met him once at a teaching event by CRR. He seemed to be a nice enough guy. The Vimeo website of James Low's teachings has recently posted 15 new videos. 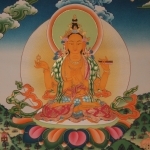 Of particular interest are 10 talks from a 2008 teaching on the "Three Words of Garab Dorje". In English with German translation. In the heart of a blossoming lotus, upon the waters of the lake, you are the spontaneously accomplished wisdom, the embodiment of the five buddha families. O great, self‐existing Lotus Father and Mother, surrounded by clouds of dakinis, to you we pray, grant your blessing so that all our wishes be quickly fulfilled! As a result of our negative actions, whenever we suffer from illness, malevolent spirits and obstacles, warfare and violence, famine and starvation, then remember your promise that even simply to think of you will immediately consume all such suffering. We implore you, from the depths of our hearts, O Lord of Orgyen, grant your blessings so that all our wishes be quickly fulfilled! To practice devotion, discipline and generosity; to liberate the mind through hearing the Dharma, and to have dignity, self‐control and knowledge—make these seven noble human qualities penetrate the minds of all sentient beings and so bring peace and happiness to the world. Grant your blessings so that all our wishes are quickly fulfilled! When oppressed by illness, suffering and unwanted circumstances, falling prey to harm and obstruction from negativity and demonic forces, threatened by fire, water, and journeys of great danger, when this life is spent and death arrives, at all these times, we have nowhere to turn except to you. Care for us with your great compassion, O great Orgyen Guru, grant your blessings so that all our wishes be quickly fulfilled! With the intention of pacifying the land of Tibet, disease, starvation, and warfare, as well as to foster the well‐being of the teachings and all beings, those of faith should keep this prayer in their heart‐mind. The first verse of this prayer is taken from Kunkhyen Longchen Rabjamʹs profound commentarial and supplemental text, Khandro Yangtig, specifically, the section on offering ocean‐like banks of offering‐clouds. The other verses are the Vajra Speech blessing of Rigdzin Jigme Lingpa, the second Omniscient One. Anyway, there are some quite good explanations of shunyata in what have recently been posted. I am specificaly referring to "The Heart Sutra Opens the Door". As we all know, shunyata is the foundation of Dzogchen so i think these teachings are quite useful. And they are in english which is helpful. He's quite good at what he does i think. Maybe its just the english, i dont know but i am recommending you take another listen here. He was a special one. yes he was. he disturb my mind! Today is in fact the 14th anniversary of Chhimed Rigdzin Rinpoche's death according to the Tibetan calendar. You can't think your way out of samsara. I went to a retreat of James' this past weekend. Lots of 'aha!' and 'ahahaha' moments. Many penny drops - he certainly has a way with words and is able to convey the simplicities and nuances of Dzogchen in a widely accessible way. Vasana wrote: I went to a retreat of James' this past weekend. I very much appreciate the lectures James Low presents. Just sometimes it would be great if he doesn't always build so many nuances all the time. Not saying it's a negative thing, just when he talks more simply without too many layers is profound itself. That's why I prefer to listen to his lectures when someone is translating so I can get time to assimilate what he says. I've been checking out his lectures as well. I have quite an affinity for his style, I must say. The Eifel Retreat recordings are really excellent. I'm very grateful for this thread popping up and introducing me to Mr. Low. He seemed to be a nice enough guy. can confirm. Even more than that, he's really availing himself to whoever seeks proceeding on the Dharma path in the Dzogchen way. He builds bridges between Tibetan tradition and Western Style, between modern need to understand psyche and mysticism. As far as I got that he is the holder of the heart line of CRR. There is an upcoming James Low teaching in January held in Lekdanling, London and organized by Shang Shung Institute UK. "dzogchen is the practice of applied phenomenology"